Anyone who's been camping in wet weather knows how unpleasant it can be to wake up in a puddle. 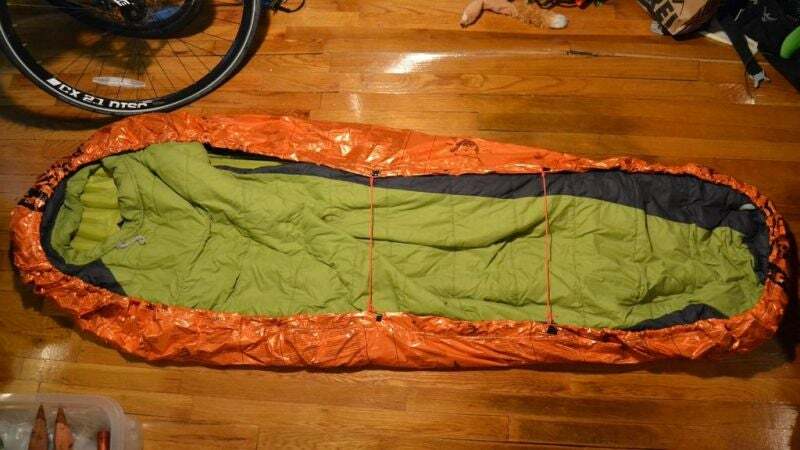 This DIY semi-bivy provides a completely waterproof layer between you and the ground. A bivy (short for bivouac sack) is a lightweight, fully enclosed shelter, a kind of sack-like mini tent. This semi-bivy, brought to us by Instructables user Heebore, provides protection just from the bottom. It's intended to give you an extra layer of insulation from the ground, as well as a waterproof barrier in case the spot you picked turns out not to be as dry as you think it is. You can put this project together for around $20 in materials, but you will need access to a sewing machine. Basically, you're going to cut an emergency blanket to shape, then sew a channel for the paracord that you'll use to cinch the semi-bivy into a bowl shape around your sleeping bag. Hit up the full article for step-by-step instructions.